Tusok Balita - Pinoy darters are everywhere to conquer the world of darts! Pinoy darters are everywhere to conquer the world of darts! 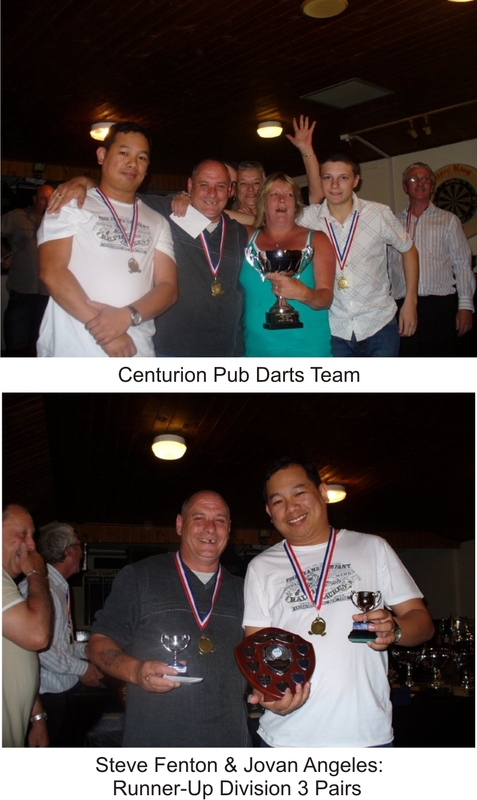 In the city of Bath, 157 kilometers west of London and 25 kilometers southeast of Bristol, Jovan Angeles, an avid Pinoy darter and his British-dominated Centurion Pub Darts Team, bagged the championship title in the recently-concluded 2010 Knock-Out Cup against Crown Pub Darts Team. Jovan hails from Gapan, Nueva Ecija where he actively promoted darts in the Central Luzon region until his departure to England. He participated in numerous NDFP-sanctioned and supported events during the heights of his playing days in the Philippines. Incidentally, he became popular to the local and international darting community during the 2010 Ladbrokes World Darts Championship for his immediate postings of Ian Perez’s live matches in Alexandra, England. 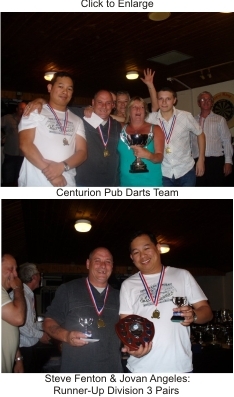 The members of Centurion Pub Darts Team are shown on the photos above: (Left to Right) Jovan Angeles, Steve Fenton, Nick Smith, Sandra Kington, Debbie Brailey and Dan Brailey.